The physicians at ACM Health Center see patients by appointment only. So once you decided to get treatment, please call us to make an appointment. On your first visit, please arrive 10 minutes early for the paper work. Don’t forget to bring your insurance card. You should set aside 45 minutes to an hour for the first visit. Wear warm, loose, comfortable clothing. Avoid alcohol and caffeine just before treatment. During your initial visit to ACM Health Center, you’ll be asked to give your medical history and related information. This data is vital in our helping physicians properly evaluate you and determine the correct path of treatments to give you. During subsequent visits, your physician will continue to keep up to date with your medical information and evaluate your overall progress to determine whether the acupuncture treatments are working or if there needs to be a change in treatment protocol. It is normal to feel nervousness, especially if it is your first time. Most patients feel an overwhelming sense of calm after the needles are in. Many patients feel so relaxed that the fall asleep during the treatment! The key to acupuncture treatments is to bring your entire body into balance and harmony. During each visit, you will have your energy pulses read to help determine the progression of your treatment. 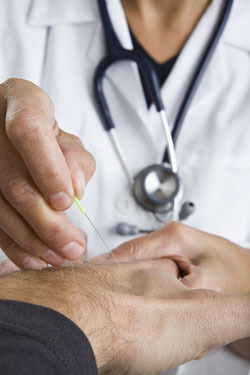 Occasionally, some patients can expect to feel mild soreness or nausea when first beginning an acupuncture regimen. Another common experience is to feel a sense of heaviness around the needles after insertion. These effects are completely normal. If a needle bothers you, let you doctor know, we can usually adjust the position of the needle to make it more comfortable for you. Treatments usually last 20 to 40 minutes. Sometimes heat pads are used after the needles. Sometimes other treatment modalities such as cupping and electric stimulation are used in addition to acupuncture. Your doctor will determine which treatment course will produce the best results. Most patients feel relaxed and calm after the treatment. For patients being treated for pain, it is not uncommon to feel improvement after just one treatment. Some patients feel a little tired and sleepy, this is normal. While some patients notice improvement right away, other may not feel much difference at all at the beginning. This is normal. In some cases it takes several treatments to notice any improvement.